Let’s say you have data like this in a spreadsheet. Don’t roll your eyes, I am 102% sure, right at this moment, someone is (ab)using Excel to create similar messy data. How do you reshape it to one column? 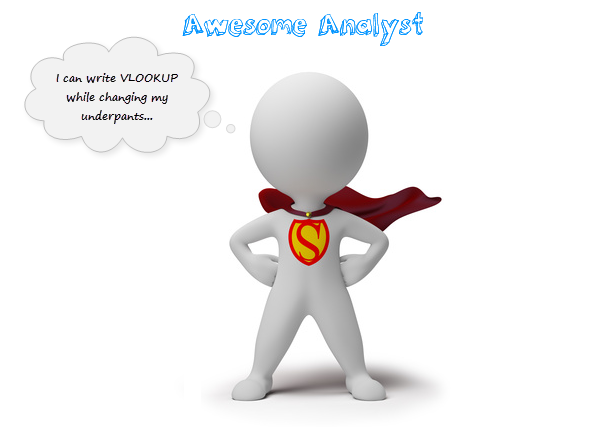 You could use formulas, VBA or Power Query. Let’s examine all these methods to see what is best. All these methods assume your data is in a range aptly named myrange. Today is Friday the 13th. If you are a raging friggatriskaidekaphobiac, I suggest you to stop reading this post. For the rest of you, I have something fun. 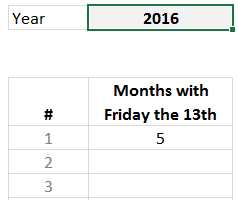 Given a year in cell C3, let’s find out all the months with Friday the 13th. Something like above. 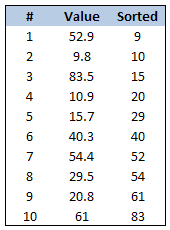 Analyzing top n (or bottom m) items is an important part of any data analysis exercise. 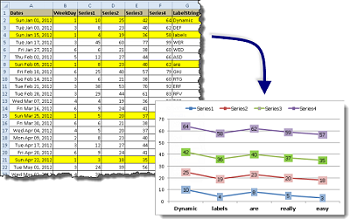 In this article, we are going to learn Excel formulas to help you with that. Let’s say you are the lead analyst at a large retail chain in Ohio, USA. You are looking at the latest sales data for all the 300 stores. 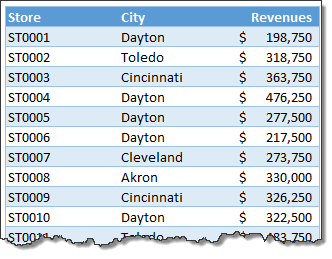 You want to calculate the total sales of top 10 stores. Read on to learn the techniques. This is a guest post by Sohail Anwar. August 29, 1994. A day that changed my life forever. Football World Cup? Russia and China de-targeting nuclear weapons against each other? Anniversary of the Woodstock festival? No, much bigger: Two Undertakers show up at WWE Summerslam for an epic battle. Needless to say: MIND() = BLOWN(). And thus begun one boy’s journey into understanding the phenomenon of Multiple Occurrences. Few weeks ago, someone asked me “What are the top 10 formulas?” That got me thinking. While each of us have our own list of favorite, most frequently used formulas, there is no standard list of top 10 formulas for everyone. So, today let me attempt that. If you want to become a data or business analyst then you must develop good understanding of Excel formulas & become fluent in them. A good analyst should be familiar with below 10 formulas to begin with. There are many web pages devoted to Excel Charts and there are many web pages devoted to Creating Dynamic Ranges, but a lot of these suffer when the data is poorly organised or non-contiguous. Today we look at a Technique for Creating Dynamic Charts with Non-Contiguous Data. Today at Formula Forensics, Guest author Sajan shows us how to extract a sorted, unique list of items, displaying the most frequently occurring items first, while restricting the output based on some additional criteria. 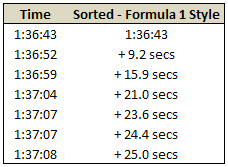 Formula Forensics 018. 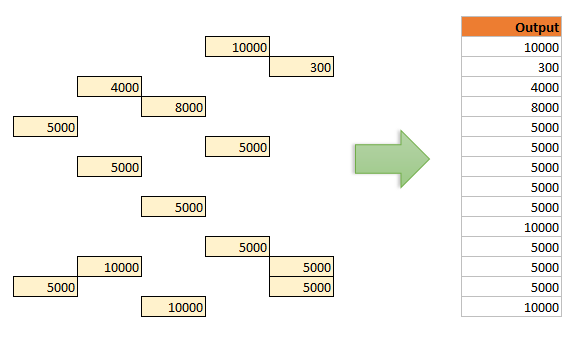 Retrieving the Nth number from a Range which has Gaps. Over Easter, while we were all busy eating our Easter Eggs, at the Chandoo.org/Forums, Slk213 was worried about how to retrieve the Nth number from a row of data which had gaps in it. Today in Formula Forensics we will look at how to solve this problem. Faseeh, responded with a neat array formula. Today Formula Forensics pulls Faseeh’s Formula apart to see what makes it tick. One of the most dreaded courses during my under-graduation is Probability, Statistics & Queuing Theory. We called it PSQT. I struggled to understand the significance and concept of this course as I could barely concentrate in the class. We had a professor, who is probably a genius, but the moment he started the class, I would magically fall in to one of my after-noon naps. When I woke up, we are either in the middle of an elaborate t-test or going thru intricacies of a Markovian queue. 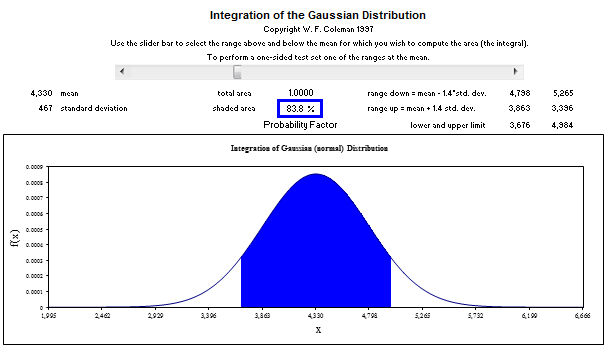 A good understanding of statistics & probability theory is necessary if you want to model complex real-life problems using Excel or similar tools. 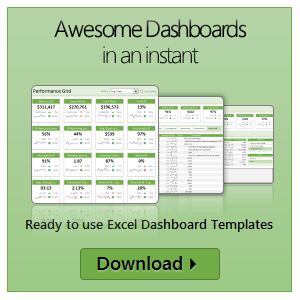 Naturally, Excel has several functions, features & supported add-ins to help you in this area. Today, I want to share some of this with you. This article is broken down in to 3 parts. Today we publish what is hopefully the First of many posts by guest author Luke M. it is also the Third post in the Formula Forensics series, which has now moved to a regular and new Thursday slot ? Luke has taken up Hui’s and 3G’s challenge of explaining how the technique he regularly uses on the Chandoo.org Forums for extracting individual records out of a group. Today Luke tells us how to extract a list of items from a larger list according to some criteria. It is no exaggeration that knowing excel formulas can give you a career boost. From someone starting at the long list of numbers, you can suddenly become a data god who can lookup, manipulate and analyze any spreadsheet. So when our little excel blog hit the 5000 RSS Subscriber milestone, I celebrated the occasion by asking you to share an excel formula through twitter or comments with rest of us. 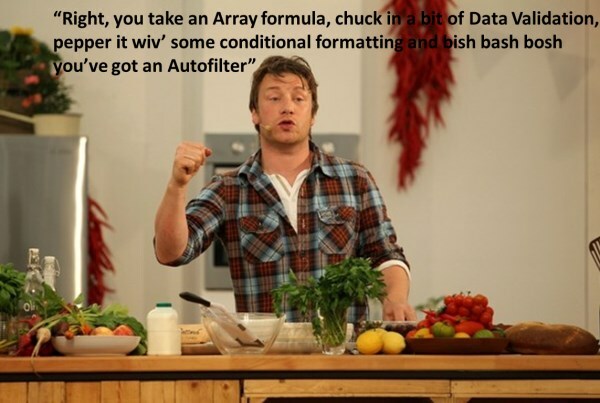 And boy, what an excellent list of formula tips you have shared with us all. Here is the complete list of entries for the twitter formula contest. 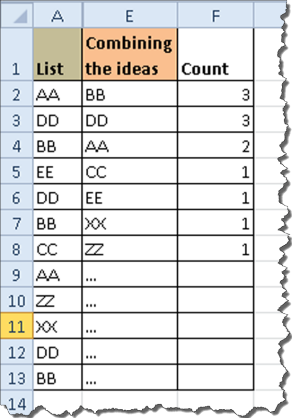 How to Round and Sort Data using Excel Formulas? Of course we can solve this by simply using array formulas. Curious? Find out more by reading the rest of this post. Today we will learn about creating in-cell dot plots using excel. We will see how we can create a dot plot using 3 data series of some fictitious data.